Shout out to past me who was unaware of my thumper pyjamas reflection in my handbag! 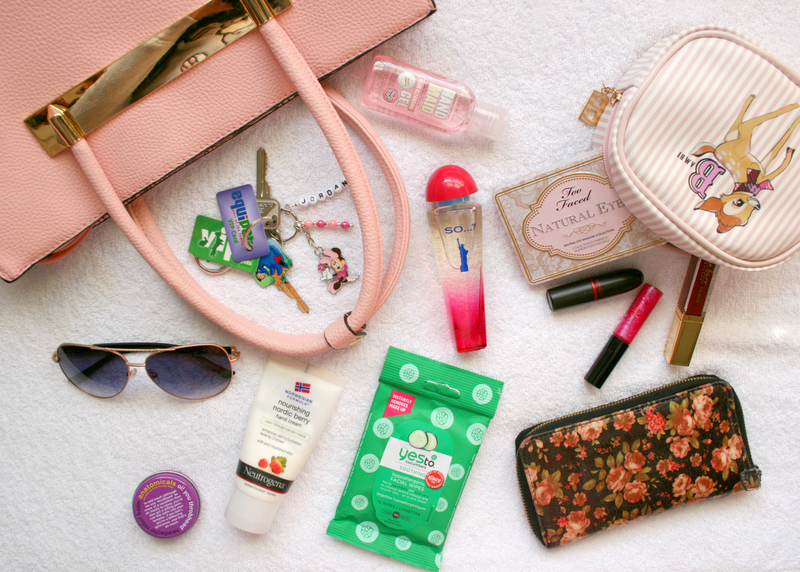 I decided it was about time I done a little what's in my bag post again because let's be honest we are all a bunch of nosey people who enjoy these posts, am I right!? At the moment my bag still isn't crammed full of junk just yet as I only got it at the end of August as a birthday gift, but give it some time and I'm sure it will be overflowing with receipts and stuff I don't need to carry about with me. The usual basically! Keys I would say are an essential but they're not really for me as it's only my house keys on them as I can't drive (forever being way too lazy to learn) but they are always in my bag incase I do go out and nobodies home when I get back. But let's talk about how much I love the Minnie keyring from Emmy because it's so adorable and I'm obsessed with it. Soap and Glory Hand Sanitizer yes I am one of those people who have sanitizer in their bag, gotta kill all them germs. Plus this one is pretty and smells divine so who doesn't want a bottle of it in their bag. I also really like that it absorbs really quickly and leaves your hands actually feeling clean unlike some other brands. Sunglasses which now at this time of year aren't exactly necessary but I think I'm going to leave them in my bag for just a little longer incase the weather decides to surprise us. Headache Relief Balm I find this to be such a handy thing to carry around with me when I'm out and about incase I ever do get a headache. It works in a matter of minutes and it's just a really great thing to have with you. Hand cream As the weather gets colder my hands start to get a bit dry and sometimes crack so this is definitely an essential for me to have with me. I'm still loving the Neutrogena Nordic Berry* and it's actually almost gone so it may be time to invest in a new own! Incase of an emergency such as my mascara running or my eyeliner trying to make its way off my face I carry a small packet of Yes To Cucumber wipes with me. I suppose they'd also come in handy if I ever did spill something on myself but I mostly use them for when I'm leaving boots to remove the 27492 different swatches on my arms. Something I'm absolutely obsessed with is the So...? NYC Perfume* and oh my goodness this smells so good! It's real fruity but not too sweet and it's just the perfect scent. I have been wearing this nonstop these past few weeks and I just cannot get enough of it. I have my Purse with me which I still absolutely despise like seriously I hate it. If you've found any nice purses recently please let me know because I have been looking for a new one for the longest time now. Finally my Bambi Makeup Bag also lives in my handbag which is the cutest thing ever. I mean just look at it, look at how pretty that is! I normally have bits of my makeup in that I've used that day incase I need to touch it up throughout the day. And that's it! Like I said I'm sure in another few weeks it will be filled with useless junk I don't need and the bottom of it will just be covered in receipts, but until then that's all that lives inside of it. I'd never have noticed your reflection in the bag unless you said! The S&G hand sanitiser is a forever repurchase for me, it smells wonderful! I just got the DKNY Saffiano Leather purse for my birthday and I'm in love with it. Perfectly timeless. Your makeup bag is so lovely, also I really want to try that neutrogena hand cream! I love your make-up bag!! obsessed with the yes to cucumber wipes, reminds me i need to go out and get some more! Oooh I'm completely intrigued by the headache relief balm! Sounds like something I need in my life! Where did you get it from and how do you use it?